I am here at the Public Library working on My weekly blogging and I decided a good post would be about WIFI. When should you use it ? When you should you not use it? I worry about people connecting on free WIFI and not understanding the if they are working on a website that does not have https setup on the login, there is a chance that a sniffer could be out there capturing their sign on information. Sniffer is a program that is monitoring the free WIFI for people to place private information. I would not want my social security number, bank account, or other account information of mine to fall into the wrong hands. The same is true for handing out my username and password to my websites. Benefits are WIFI is almost everywhere now. If you need to check your e-mail or browse the web, play a Facebook games like candy other the internet games. You can use the free WIFI. How many times do I see a family with young children pull up a movie on their phone to entertain a child that is waiting for their food at a restaurant or in a doctor office waiting room? These are great was that people are using free WIFI. 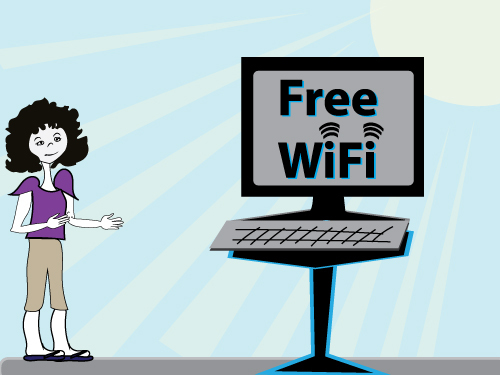 Dangers of using Free WIFI you can lose private information because you are comfortable with the free access to the internet. If someone gains access to your credit card # or Social security it can be a problem with Identity theft. If they capture your Username and password to your website, they can hack your website and add, change or delete content. If you are running an e-commerce website they can have access to your customer information which is detrimental to your business. Private WIFI connections … the Public Libraries* have the computer you can use on private connect with a firewall and high security. If you do not have access to your own private wifi or internet connection this is a place you can work with confidence. *Please check with your library to make sure that the computers are on private connection and not on the free WIFI that is used throughout the Library building. Home WIFI should be setup with a password and maybe even a firewall depending on what business you need to transact using the internet. Use a hotspot with your phone or another device that has the internet connection is also a good choose to protect your private information. I find that my hotspot also allow me to access information faster on the internet. You will need to follow up with your telephone provider to determine if your plan allows for using it as a hotspot. Free WIFI is a very nice feature that a lot of businesses offer and I am happy they do. I just wanted to point out if you are using free WIFI that you should be careful not to place your private information out there where others can steal it.